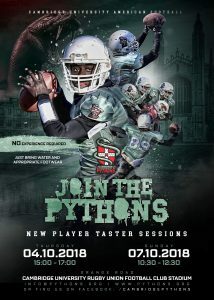 The Pythons will be having non-contact taster sessions on Thursday the 4th of October from 15:00 to 17:00 and on Sunday the 7th from 10:30 to 12:30. These will both be at Grange Road, next to the rugby stadium, and are a great chance for people who haven’t played before to get a feel for the game. Those who have played before and are thinking of playing football this year should also come along, as it will be a good refresher, and a chance to meet a lot of the current players. There will also be two Pythons booths at the CUSU Freshers’ Fair, held on the 2nd and 3rd of October on Parker’s Piece. There will be an outdoor booth and one inside the marquee. 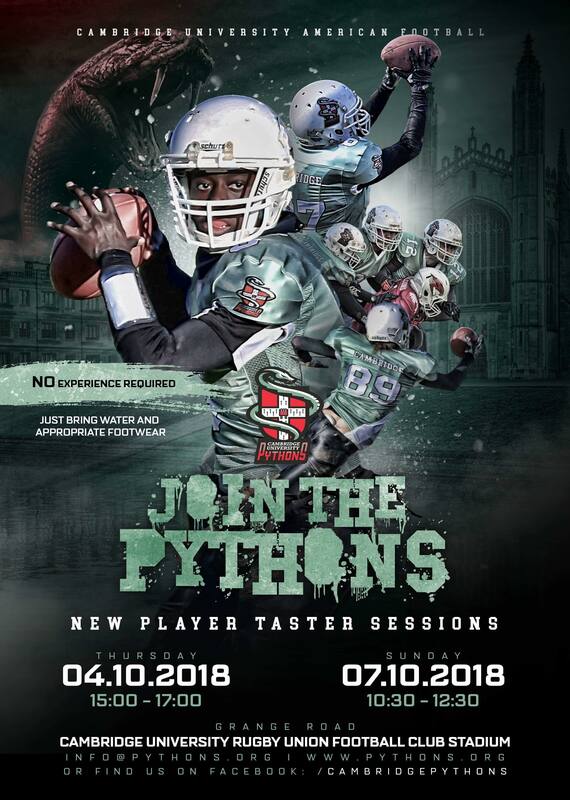 These will be manned by current players, so do come along and ask any questions you have, and sign up for taster sessions and the mailing list! You can also meet us at the University Sports Fair, held on the 1st of October from 13:00 to 17:00 in the University Sports Centre.